Please raise a glass – if you’re not doing Dry January, of course – to our nation’s exceptionally talented CEOs and their superhuman work ethic and skills. For the average executive to have earned the equivalent of a worker’s average annual salary by 4 January is surely testament to an unimaginable amount of hard work and graft. They must truly deserve the 11% hike in their salaries since last year, unlike millions of good-for-nothing slackers like nurses and teachers who have endured years of stagnating pay. It is worth taking a moment to absorb how great the gap now is between the worker and the boss. Top executives now earn 133 times more than the average worker; in 1998, the ratio was 47. The salary of the average FTSE chief executive is the same as that of 386 Britons on minimum wage combined. This in a country where workers have suffered the worst squeeze in wages for generations, where most Britons languishing in poverty are actually in work, where child poverty has increased at its fastest rate for three decades, and where one in every 200 people are classed as homeless or in inadequate homes. It is not a trend restricted to Britain, of course: US top bosses earn 312 times the average worker’s wage. We are indoctrinated to believe that the booming paypackets of the boss class are down to their get-up-and-go, their innovation, their phenomenal hard work. This is used to justify and rationalise the explosion of inequality, not as evidence of an utterly broken social and economic model, but as just desserts. It is a pernicious myth. This is the wealth collectively produced by the hard effort of millions of people, who labour by hand or by brain. All of these CEOs depend on lavish state largesse: whether it be an education system (and its teachers) who train their workers, the nation’s expensive infrastructure, a law and order system to protect their property, research and development whose products they can commodify, a social security system to top up their workers’ low wages – I could go on. That is why we should snap out of thinking that they somehow deserve these vast sums: they don’t. And that forms the basis for arguing that far more of that money should end up in the paypackets of their workforce, reinvested in their companies and invested in the nation’s public services and infrastructure. I agree. The problem is what do you do about it. shame the parasites at every opportunity. They’re impervious to shame, Blazer. There has been a negative change in management. One large company i worked for the General Manager held the job for 15 years. He would go into a plant and would remember the names of more than half the employees in a plant. When I left there had been 4 CEO’s in 8 years and none ever ventured near the plants. One of the duties of a nominated employees was to conduct a safety audit once a week. Remembering the names of more than half the employees in the plant still doesn’t really compensate for the wage-&-salary differential though, does it? Perhaps i didn’t elaborate enough. Back in the day the General Manager managed the company. Seems many CEO’s today manage a lot of spread sheets. CEO’s are probably paid no more than 1% of a large oranisations salary. Upper and middle management take huge chunks of the salaries. Even senior or junior office managers have raised levels. Cutting out CEO’s would be the easy part. Try telling some one even 10% above your salary to take a cut and see how far you get. More complex than meets the I. Interesting and relevant point. I wonder if there are any statistical analyses? We talked about general stuff, and got on to the subject of his last employment. Before coming to NZ he had worked in an retirement village; before that as a contractor for black projects ( his descriptor) run by the British Government. It was my term to say ” Er what’s that about?’, the disconnect was jarring. I started pumping him for information. He laughed and said they would shoot him if he broke his security clearance. He was bound by that for life. However, he said he would give me an outline of a project he worked on before they made him sign a security clearance. He told about an old detection method once used by Britain to detect enemy aircraft. It involved mirrors and sound waves. Superseded by radar it became obsolete until a boffin in the 80s decided to take another look at this ancient technology and rejig it as an ‘offensive weapon.” I had never heard of this technology. Still hadn’t until yesterday. all that was going over my head. I said the technology sounded as if it came from the same era as Loius Rota’s work. That impressed him and he carried on talking and talking. Yeah he strung you along good Corky. Back in the 70’s old timers always spun yarns about how some joker they new in the 40’s invented the fastest machine gun or a tank which could knock out ten tiger tanks with one shell and a fighter plane was invented in Gore in 1939 which flew a 1000 miles an hour but the Yanks said no etc etc. But then in those days they used to send young fullahs to the bosses office for a long wait or to get a sky hook or a can of compression. Good old days 🙂 Now did I tell you about this trip I took in the bush East of Whangamomona when i came across a herd of Moa and the 90 foot eel I caught? Dude, trolling is an art form…not to be used like an All Black ruck 🙄🙄🙄. I’m down ticking you for bad form and being a complete waste of space. Corky is, of course, the YNZ resident troll, Across. He doesn’t care for what he sees as rivals; i.e, anyone who doubts his word and/or disproves what he says. What he does isn’t trolling in his eyes, only people who disagree with or doubt him (or expose his falsehoods) are trolling. One of his lies about me was that I had described the people across the road as feral. I had never mentioned them here, and as they are a really nice young professional couple, feral is the last word that I would use of them. Moana has a Maori Anglican father and a Pakeha Catholic mother. I first meet Moana when she was cutting Kua Makona with Delvanius. She is beautiful is that the same as cute? Yes that’s the one. Kua Makona I remember that. That’s enough … (drink) Mind she was smoking a lot dem days maybe should of applied to smoking and of course over eating. Yes I said cute hoping I would not be picked up for saying the “b” word 🙂 Yup Kiri was a very White Maori same with John Rowles and Howard Morrison. And as I said in another post Winston Peters and Billy T James. But to be fair they were all victims of the time when hiding your Maori side was compulsory if you wanted to advance in European society. The good Kiwi was never a Maori in the 50’s , 60’s, 70’s. Kids raised post 1980 had it a lot easier thank goodness. That the shelia who doesn’t talk much about her Pakeha mother….cuz? @Corky.That the Shelia who doesn’t talk much about her Pakeha mother….cuz? I don’t know Corky. You met Moana and spoke with her? Once, at Clive Hotel just out of Napier. The whanau was back for some get together regarding Everard Jackson. Whats your point? I’m sure my cuz can give us an answer if you wait. @Corky.” Whats your point? I’m sure my cuz can give us an answer if you wait.” So are you saying she hid her Pakeha side to fit in with the Maori image of the band and the song Black pearl? No, I’m not saying that. I’m just saying going on what she says publicly her pakeha side doesn’t seem that important to her. Happens a lot to celebrities. Michael Jones + Sonny Bill are seen to be Polynesian yet they are mostly European in the way they live. Barack Obama was half white and was brought up by his white mother and his white Grandmother and white Grand father yet was sold as a black President. Sometimes it pays to play along with the image. Billy T. James was no Maori but played the dumb Maori fullah because White New Zealanders payed him well to play the part. Winston Peters has always played the Maori boy who saw the light and turned into a Pakeha yet Winston is no Maori. Not quite sure where Simon Bridges fits into the image game but he might not be in the job long enough for us to find out. Lyn of Tawa and Fred Dag were all image. They were both posh school educated but found fame and fortune by playing dumb Kiwis. In fact posh people playing dumb people is very common in live acting and TV comedy. How come they don’t parody their own class? Most of the Labour Party members in England are University grads making a living representing the poorer classes while living in Mansions. One classic is Sue Bradford . She is as posh as the Queen but when she joined the Alliance/Greens she suddenly developed a faux down in the dumps west Auckland angry solo mother accent. Geeze Wayne. Even Mcphail and Gadsby were fake. The right image sells make no mistake about that. I don’t see why that’s a problem, bro? It’s of no importance to me. She’s not my kind of person. It was just a smarmy reply to smarmy comments. I meet that guy . Good old Sam Cash was a family friend for years. As those photos have no connection with the very tall story told by the electrician, it’s hard to see how anyone can believe the story except Corky. It’s an obvious fantasy. Across, you will learn that doubting his fantasies is considered to be trolling, as is disproving them. His mocking, sneering and abuse are not trolling, of course, any more than his outright lies and pervy speculation are. When I pay a tradie, I don’t want to pay him to sit yakking, eating carrot cake and drinking coffee. I want him to do what he came to do and leave. At the prices charged by tradies, a nice chat and afternoon tea are an expensive luxury that I don’t want to pay for. Wow, now Kitty adds lie detection to her tool kit. She knows my life. Hell, all I had to do was ask and she would have told me about acoustic mirrors. Wow, absolute genius..and quite true if he was on the clock. He wasn’t. I asked for a quote before hand. The boss had come around because he said on the phone a quote may not be possible because the job couldn’t be quantified. However, after being shown what I wanted done, he did a few inspections and said the job should be straight forward and his worker would tell me if extra work needed doing once he started the job. The only fantasy here is from a busy body bore who lives off other peoples posts feigning she can mind read. By the way, Kitty…can you fill this blog in on Loius Rota’s work. I mentioned him above. One doesn’t need to be a mind reader to know when someone is talking nonsense. Is anyone called Loius ? I find it hard to believe that all that was necessary for installing a powerpoint, which is a very straightforward job and can be DIY . Inspections by the boss??? Come on. The whole story sounds like another of your fantasies, like the one about the cloudbuster man at Victoria. NB, don’t be so specific as there is bound to be someone who has been there and knows the place. Really? Good luck with getting a compliance certificate and an insurance payout should there be a fire. About the cloud buster. As I stated, that is free for anyone to build and experiment with. Have you built one? No. That makes you ignorant and not fit to comment imo. Of course I haven’t built a cloudbuster; they have been totally debunked and I have better things to do with my time than build a piece of rubbish that doesn’t work. It can be done if it’s done in a workmanlike manner and it’s not done for pay. There are, of course, limits to what can be done. If fittings are sold, it’s likely that people can use them. Then you have no right to talk bs on something you know nothing about. You are ignorant. I have read enough about these ridiculous objects to know that they have been totally disproved and debunked. The fact that I haven’t made one is irrelevant. If they worked, there would be far fewer droughts in the world. Your excuse was that the owners of them don’t go there if they haven’t been invited; in other words. they’d let people die because they haven’t been invited to make the rain that would save them. Pathetic. I haven’t made a paper umbrella, either, I don’t need to use one to know that it wouldn’t work. I haven’t made the machine that supposedly cures cancer by vibrating the palms of the hands; I know that that doesn’t work, either. The fact that those who did died of cancer is enough of a hint. It goes the other way, of course; I don’t need to have built a plane, train or car to know that they do work. Yes, that’s incredible. You are right. No one to my knowledge is called Louis. Let me correct my mistake so you can tune in with your huge intellect. Louis Rota was his name. I’m not talking nonsense. You seem to know everything. Fill us in on his work. Post something of substance for a change instead of regurgitating tired cliche’s and catch phrases. The name you gave was Loius, not Louis. The only tired cliches and weary old catchphrases are used by you. You must be talking nonsense about the installation of the power point. It is an easy job that doesn’t even need an electrician, never mind inspections by the boss. What do you take people for? I don’t claim to know your life; I do know when someone’s talking rubbish. I have no wish to know about your life. You have in the past claimed to know about mine; that I have never had a husband, that I live on a widow’s pension (when there is no such thing), that I don’t have insurance (???) and various other falsehoods like the feral neighbours and various racial slurs that I was supposed to have used but hadn’t, needless to say. It takes about 20 minutes to do one, and as you can buy the power point fitting in any hardware shop, it hardly seems a job that needs inspection and ‘quantifying’. We had one done here and it didn’t take long; a friend who knew about these things did it with a fitting from Bunnings. I said, could I ask her some questions, pointed out where her answers didn’t make sense if you thought about it or when you considered this that and the other thing, and then smilingly told the older lady that from the answers she just gave she was obviously a much better person than her God. We each agreed with a grin there wasn’t any prospect of either of us changing the other’s mind and wished each other a pleasant day. Do they still offer free Watch Tower and Awake magazines? They had Watch Tower and something else. But when I asked the older lady why she believed in her God, did she believe everything in the Bible was true, and was God all powerful, all good, all wise, all knowing, and how was it fair that Adam & Eve ended up damning us all, and why did Jaweh kill all those people he killed, and would she kill them (no), & if God was all wise how come everybody is so confused about which parts of the Bible are true, and why are there all these conflicts in the Word of God n stuff, she hung on to everything to have a think before replying. And then realised I probably wouldn’t find them very useful. I’ve been very patient and accommodating but need to tell him there’s really no point in continuing to visit. Well, I don’t always have the time like this morning and usually I need to end the conversation, but I always just tell the I don’t believe in Jaweh or any of the Abrahamic Gods so I’m not really interested. If they ask me what I believe or why I don’t believe I’ll usually answer them kindly & say why. But then I’ll ask them what they believe in the Bible & why they believe any of it. But it’s because I’m knowledgeable about the topic, enjoy the Q&A, & I like to watch them thinking and then working out as they listen to themselves that their answers aren’t even really convincing to themselves. If possible I always like to end by pointing out they’re a much better person than their God is. Some hurry away, but some just wander off after farewell pleasantries looking thoughtful. The JWs used to visit here semi-regularly but don’t anymore. Funny thing is I recall the last time they came quite clearly. I had been assisting in a calving and was in a desperate need of a clean. I had pulled off my overalls and was in the process of hosing down all my clothes when they arrived. Two attractive young girls and an older guy, face to face with a naked farmer hosing down his clothes. I was prepared to talk, but they seemed to need to be elsewhere in a hurry. That was years ago, they have not been back since. No, I haven’t heard of them before but I’m sure they worked, in terms of reflecting and possibly even amplifying the sound of approaching aircraft, the same way amphitheatres, or the opposite bank of the stream here work. They just wouldn’t be very useful for estimating height, numbers and distance. And as the article notes, when the speed of prop aircraft doubled during WW2 they’d only catch a flash of sound eventually. Mathew Hooton applying the hurt to Fonterra on talkback at the moment. He accuses them of adding no value to their product and wasting time on trying to destroy A2 Milk. He also said they lost theIr complete market control of milk products in Sri Lanka to Nestle. Isn’t “complete market control” or monopoly a ‘bad’ thing? It is when a socialist government puts constraints on how Fonterra can operate. That’s why in reality Fonterra doesn’t have a complete monopoly. Hooton is calling for a clean out of directors. Something wrong somewhere there, Parti. Is it the foul language? No. Ah,yes, I have it. Fonterra will ask the government to remove all constraints under which it operates. Once that’s done it will just need to march into any country and operate however they like. Stuff the sovereign rules of that country. Stuff their regulations… when Fonterra from Aotearoa comes a callin you had better get in line and kowtow. We do it for the Chinese Corky … Why shouldn’t the Sri Lankan’s do it for us? Anchor is still the largest brand in Sri Lanka- what is Hootun going on about. ‘New Zealand’s Anchor and Ratthi brands control 60 per cent of Sri Lanka’s milk powder consumption market which is estimated at 85,000 metric tonnes (MT) annually, industry sources said. University of Auckland business school associate professor Gehan Gunasekara said he could see why Tamil people would be upset by Fonterra’s decision not to include their language on its butter. “That could cause some Tamil people to be offended,” Gunasekara said. Gunasekara said he visited Sri Lanka recently and was surprised how prevalent Anchor branding was. “You can’t go 100 metres without seeing the Anchor brand. Poor bloody Tamils … !!! On Nov 7th 2018 the US Attorney for the Southern District of New York notified a Committee of lawyers petitioning for an inquiry into the events of 911 that in accordance with US statue, he would present their case to a special grand jury. Prepared by the Lawyers Committee for 911 Inquiry, the 52-page petition, including 57 exhibits of evidence, claims to prove that on Nov 9th 2001 the major 3 buildings of the New York Trade Centre complex were destroyed by pre-planted explosive devices. In support of these claims, the Lawyers Committee asserts that its evidence is conclusive and unequivocal and permits no other conclusion- as a matter of science, as a matter of logic, and as a matter of law. Why have these stories not been reported in our media? Where are the investigative journos? do we have any in NZ to speak of. Besides Nicky and Ian …. 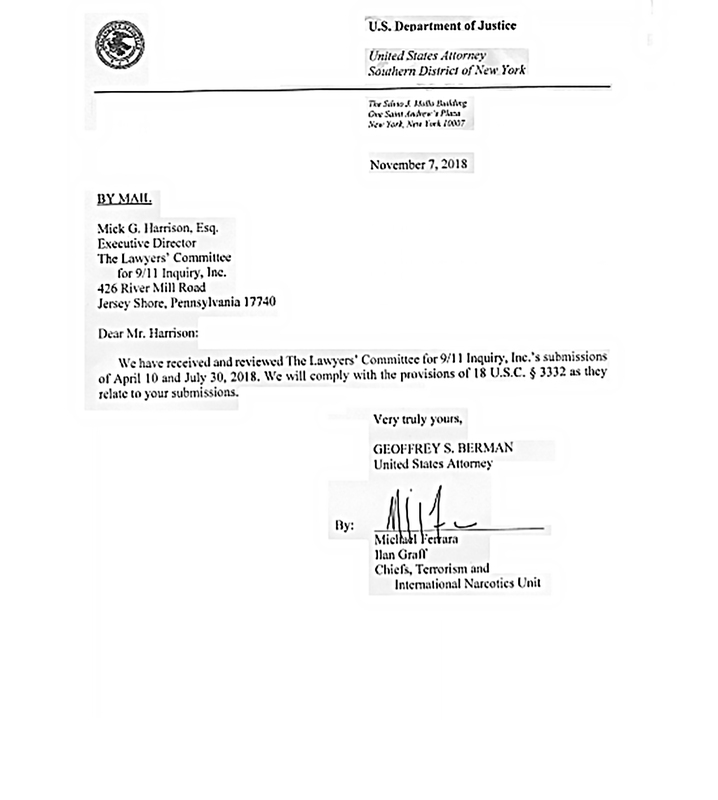 The U.S. Attorney notified the Lawyers’ Committee in writing that he would comply with the provisions of 18 U.S.C. § 3332 requiring him to relay their report to a Special Grand Jury. don’t know you well enuff for that. Read the law . It says MAY put information before a special grand jury. It may help you to realise this is the way the ‘deep state’ shuts down stuff. 🤔 Maybe because investigative journos need a way of getting paid … and that’s what they’re off doing … not doing investigative journalism? Gawd these stories have been reported in the media, they’ve been debunked so often I think everybody’s just given up as there’s never anything new and it’s not worth the effort of having the endless arguments from some of the fringe nutters or spending any more money on it. but I am wondering if there is anything in this story which came by me in a letter in the Northland age today. Of course, I will not give all of my energy to it as the wai262 needs looking into as well and the fish fertiliser needs turning ewwwww. This is the most well-known conspiracy theory Possum. it’s been around since 2001. There’s a ton of material on it on the net if you can be bothered going looking for it. I spent time over several months looking into the for and against arguments. The controlled demolition conspiracy claims just don’t add up, but you need to work through a ton of material, not all of which comes up on initial google searches. yea nah I Have heard all that before bro but it has neva come to this point. not really that concerned about others views on history just the letter I read today. oh well, here I come smelly fish. You’ve reminded me, whatever happened to Uggers (Ugly Truth)? He was a great believer in most popular conspiracy theories, including that someone dropped a neutron bomb in Yemen. The Deep State Forces might’ve located his bunker? Yup. Looks like they took out his website, too. I still had it bookmarked. That one seems to have been written by someone who had psychedelic weirdburgers for lunch first. This might sound stupid (and possibly is! ), but it’s a serious question. Many commentators say the Green Party is socialist. But looking at their policies I don’t see socialism, or at least not in a form I understand. Socialism was traditionally about the workers, owning the means of production, personal returns based on input, egalitarian social togetherness etc, but always with a recognition of the interdependance of individual and collective. Socialist citizenship is equally about rights and responsibility. But modern ideas labeled ‘socialism’ seem to be about something altogether different. For example the Green Party TOW policy essentially gives a different degree of citizenship to people depending on DNA. Their pro-beneficiary policies are the opposite of traditional socialism, with tax-paying workers supporting a non-productive class who are receiving this as a right with no social obligations themselves. Surely these two policies alone mean the Green Party is not socialist? And as for all the identity politics stuff we are bombarded with with every ‘victim’ trying to prove ‘most aggrieved status’, this stuff seems fundamentally opposed to true socialism. So am I missing something? Has ‘socialism’ radically changed it’s meaning? Or has the identity politics victimhood bs taken over and traditional socialism taken a back seat? Socialism always required an essential human dignity that sadly the modern self-obsessed alleged leftie seems to have lost. Well, you’ve given a pretty good rationale for why we could just larf at people who call the Greens socialists, or communists. Social Justice Warriors is still good though. Well Ben, perhaps you can take consolation from the fact that modern self-obsessed ‘Righties’ have lost a great deal more essential human dignity than so-called Lefties? I wasn’t clear, I always think of myself as LW. I was a member of the Communist League for a short time while at uni, and have voted green 4 elections in a row until last election when I voted Labour. I didn’t vote green because I could no longer see true left values in their pro-beneficiary policies, amongst other things. Entitlement without responsibility is not a LW value. Hence my description of ‘self obsessed lefties’, supposed to be a distinction from socially-aware lefties. Yes interesting comment that the right uses ‘socialism’ as a derogatory term, are you suggesting that this is where the change in meaning of ‘socialism’ to pro-victim pro-identity pro-individual rather than pro-society as a whole has come from? I doubt if the Left are any more responsible than the Right for “entitlement without responsibility” … What would be a “true left values” beneficiary policy? Work for the dole? A very brief look just now at Green Party policies demonstrates considerable social awareness to me … I like their TOW policy which acknowledges an ongoing relationship … not something to be ‘finalized’ … I don’t see “support of people while they need it” as entitlement without responsibility. You’d have to show me an example of pro-victim? No, Parti. Socialism and its derivatives have been put to the test time and again. And time and again they have failed. Sometimes with huge loss of life. Righties just point out these facts, while simultaneously pointing out the benefits of capitalism. While far from perfect, capitalism has proven itself time and again.